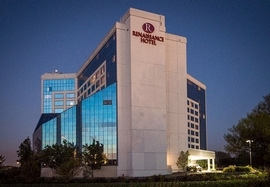 This Renaissance by Marriott is one of our nicest options for hotel accommodations! Although Marriott has 160 Renaissance hotels worldwide, each hotel is unique and different, so you can expect something new with each property! Generally, we've found that the Renaissance hotel is full-service, meaning it has a restaurant, lounge, room-service, and also has a fitness center and business center. But overall, the hotels do have one aspect in common: amazing guidance for local experiences! The Renaissance has a neat yet uncommon feature to welcome guests to the area: designated "Navigators," which are staff members who know the surrounding area well and can guide guests to local entertainment, dining, events, and more. What a great way to start the vacation early! The Renaissance is an excellent choice for all traveler types.